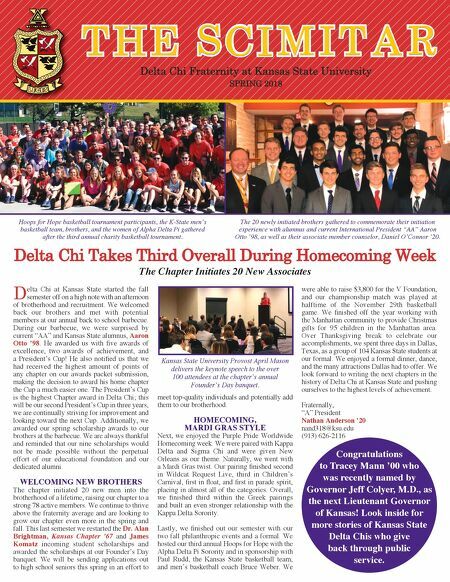 Delta Chi Fraternity at Kansas State University SPRING 2018 Delta Chi Takes Third Overall During Homecoming Week The Chapter Initiates 20 New Associates D elta Chi at Kansas State started the fall semester off on a high note with an afternoon of brotherhood and recruitment. We welcomed back our brothers and met with potential members at our annual back to school barbecue. During our barbecue, we were surprised by current "AA" and Kansas State alumnus, Aaron Otto '98. He awarded us with five awards of excellence, two awards of achievement, and a President's Cup! He also notified us that we had received the highest amount of points of any chapter on our awards packet submission, making the decision to award his home chapter the Cup a much easier one. The President's Cup is the highest Chapter award in Delta Chi; this will be our second President's Cup in three years, we are continually striving for improvement and looking toward the next Cup. Additionally, we awarded our spring scholarship awards to our brothers at the barbecue. We are always thankful and reminded that our nine scholarships would not be made possible without the perpetual effort of our educational foundation and our dedicated alumni. WELCOMING NEW BROTHERS The chapter initiated 20 new men into the brotherhood of a lifetime, raising our chapter to a strong 78 active members. We continue to thrive above the fraternity average and are looking to grow our chapter even more in the spring and fall. This last semester we restarted the Dr. Alan Brightman, Kansas Chapter '67 and James Komatz incoming student scholarships and awarded the scholarships at our Founder's Day banquet. We will be sending applications out to high school seniors this spring in an effort to meet top-quality individuals and potentially add them to our brotherhood. HOMECOMING, MARDI GRAS STYLE Next, we enjoyed the Purple Pride Worldwide Homecoming week. We were paired with Kappa Delta and Sigma Chi and were given New Orleans as our theme. Naturally, we went with a Mardi Gras twist. Our pairing finished second in Wildcat Request Live, third in Children's Carnival, first in float, and first in parade spirit, placing in almost all of the categories. Overall, we finished third within the Greek pairings and built an even stronger relationship with the Kappa Delta Sorority. Lastly, we finished out our semester with our two fall philanthropic events and a formal. We hosted our third annual Hoops for Hope with the Alpha Delta Pi Sorority and in sponsorship with Paul Rudd, the Kansas State basketball team, and men's basketball coach Bruce Weber. We were able to raise $3,800 for the V Foundation, and our championship match was played at halftime of the November 29th basketball game. We finished off the year working with the Manhattan community to provide Christmas gifts for 95 children in the Manhattan area. Over Thanksgiving break to celebrate our accomplishments, we spent three days in Dallas, Texas, as a group of 104 Kansas State students at our formal. We enjoyed a formal dinner, dance, and the many attractions Dallas had to offer. We look forward to writing the next chapters in the history of Delta Chi at Kansas State and pushing ourselves to the highest levels of achievement. Fraternally, "A" President Nathan Anderson '20 nand318@ksu.edu (913) 626-2116 Hoops for Hope basketball tournament participants, the K-State men's basketball team, brothers, and the women of Alpha Delta Pi gathered after the third annual charity basketball tournament. Kansas State University Provost April Mason delivers the keynote speech to the over 100 attendees at the chapter's annual Founder's Day banquet. The 20 newly initiated brothers gathered to commemorate their initiation experience with alumnus and current International President "AA" Aaron Otto '98, as well as their associate member counselor, Daniel O'Connor '20. Congratulations to Tracey Mann '00 who was recently named by Governor Jeff Colyer, M.D., as the next Lieutenant Governor of Kansas! Look inside for more stories of Kansas State Delta Chis who give back through public service.